The Stedman Grand-Slam is built to handle thousands of materials, ores and chemicals in wet and dry applications. The crushing action of the Grand-Slam delivers properly sized material the first time through. The field-proven, Stedman Grand Slam secondary impactor will give you years of dependable and profitable service. Innovative features make it superior in performance to any type any of its kind today. These are available in 12 low maintenance, minimum downtime models with interchangeable breaker bars, breaker plates and side liners for all models. Design simplicity offers safe and easy access for breaker bar replacement and unexcelled access to all other areas of the crushing chamber. The front opening feature eliminates need for a crane. If preferred, Stedman also offers a rear opening housing on all models. The feed enters the primary crushing chamber and meets the breaker bars which impel the feed against the front breaker plate. This action and the collision of material against new feed results in impact reduction. Material is sufficiently reduced in the primary chamber and passed by the front breaker plate, entering the secondary chamber for final reduction. Breaker plates are shaft suspended at the front and from a spindle in the rear, allowing for continuous gap adjustment as wear progresses and assuring superior product control. Download the Grand-Slam brochure for specifications & typical gradations for clay, tile, dross and carbide pieces. 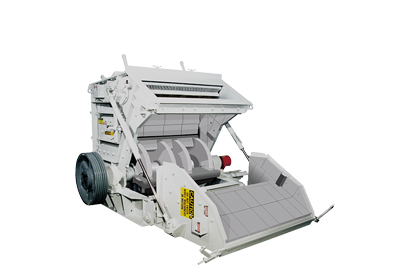 Cubical gravel crusher with high crush count. We invite you to visit the Stedman Testing and Toll Processing Facility where we offer thousands of application reports to assist you in choosing the right machine for your job. To learn more about what to expect from testing, read this article that ran in POWDER BULK ENGINEERING magazine.